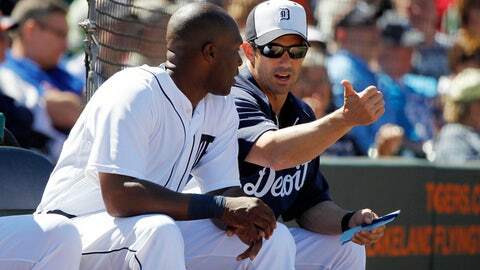 Tigers manager Brad Ausmus said every player has the green light to steal at their discretion, and he's encouraging them all to experiment in pushing the envelope in taking extra bases. 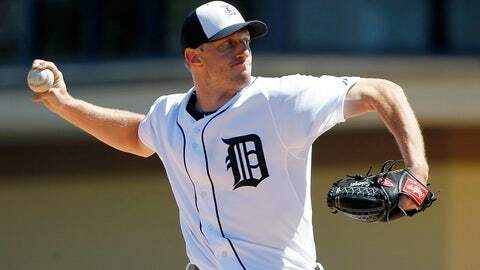 LAKELAND, Fla. — Fans can expect to continue seeing the Detroit Tigers take plenty of chances on the bases in Grapefruit League games. Tigers manager Brad Ausmus said every player has the green light to steal at their discretion, and he’s encouraging them all to experiment in pushing the envelope in taking extra bases. "We want to force the defense to make plays," Ausmus said. The "Go-Go Tigers" have been on display in the first four Grapefruit League games, going five for six in stolen base attempts and taking plenty of extra bases. However, there was a big inning that was diffused Friday against the New York Yankees. Rajai Davis got picked off second base before Miguel Cabrera got thrown out trying to go from first to third on a walk. Ausmus had no problem with that, noting that strong throws were required to get the outs. "I’ve been very happy with the base-running," Ausmus said. "That doesn’t bother me." He likes the mindset that is evolving on a team that had the fewest steals in the majors last year with 35. Adding free agent outfielder Davis, who stole 45 bases last year for the Toronto Blue Jays, and trading for second baseman Ian Kinsler, a proven 20-plus base stealer, heavily influenced that decision. "It might be different if we hadn’t signed Rajai and made the Kinsler-for-Prince Fielder trade," said Ausmus. However, he stressed that the fastest runners aren’t always the best base-stealers. It’s seeing an opportunity and taking it that Ausmus stresses on the bases with running game coach Omar Vizquel. "You are more into the game that way," Ausmus said. That’s why Cabrera getting thrown out trying something totally unconventional did not bother Ausmus. He liked that Cabrera was busy calculating the move, and thought he caught the Yankees napping. Kinsler said, "This is the way you win baseball games. Putting pressure on the defense is huge. Brad definitely has that in mind, and wants this to be a team that runs intelligently." Ausmus said he will shut off the group green light once the season starts, and then decide which players still have it. Davis and Kinsler are good bets, but Austin Jackson and Torii Hunter also could receive the green light much of the time. "He’s not ready to pitch," said Ausmus, adding that he’s playing long toss at 120 feet. "As long as he stays within himself and uses the whole field — especially to right-center — he’ll be OK," said Ausmus, who wants to assure that Castellanos doesn’t go away from his strength and get pull-happy going for homers. Max Scherzer was absolutely beaming after his Friday afternoon outing. "Adam Everett sent me a text today," said Ausmus, referring to his former Astros teammate who also played in Detroit and now coaches infielders with Houston. Morgan Ensberg is another former teammate now coaching for the Astros organization. Ausmus said those two and some clubhouse workers are the only ones remaining from his era. Even the league has changed in regard to his old team. "Every time I think of Houston," said Ausmus, "I have to remind myself they are an American League team now."